People are important beneficiaries of effective coral reef management and valuable stewards of local reef resources. They are also the cause of most threats to reefs. As a result, communities and other stakeholders are central to effective coral reef management. Understanding the links between people and coral reefs is integral to good decision-making and fundamental to achieving a sustainable balance between biodiversity protection and development. While the importance of social science is now widely recognised among coral reef managers, there is still a need to increase the integration of social information into decision-making processes. This project builds on international experience, including from the Great Barrier Reef and the Caribbean, to develop resources that can assist reef managers understand and use social vulnerability and impacts assessments. 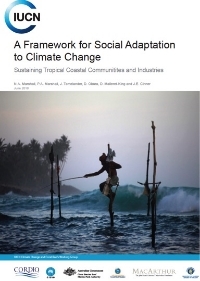 It compiled resources to support managers to incorporate social science concepts, tools and methods into projects and decisions as a foundation for improved integration of social and ecological resilience in the management of coral reef systems. For more information about the Social Resilience collaborative project, please contact paul.marshall00@gmail.com.